We at Trekaroo obviously love travelling, driving, flying, riding, cruising. Any and all travel methods have collectively been pursued by our gang. The Bubble Bum has been a life-saver to a quite a few of us in the Trekaroo family! The Bubble Bum is easy to take on the go — on land, sea, or in the air. Really. Bubble Bum goes everywhere! Keep it in your car as a ‘backup’ device for when you help out a friend with school or sports pickups or daddy drop-offs. Taxis? No problem. Uber? Easy. Inflation is a breeze and folding it up is a snap, with the entire seat fitting into a diaper bag or purse. It’s easy for us to tell you: Bubble Bum is a Trekaroo family favorite. The Bubble Bum booster seat works well for when we transport friend’s children from the various activities and we’re in need of an extra seat that is safe. 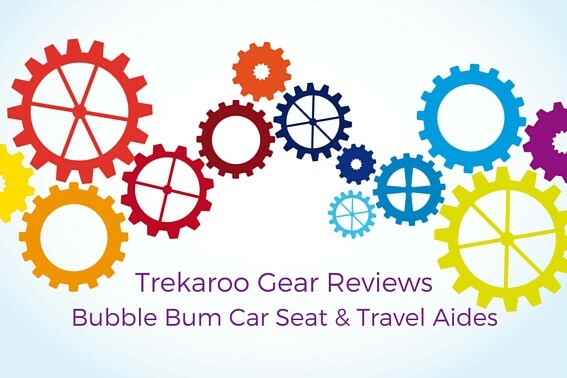 One Trekaroo family keeps the Bubble Bum under the seat and brings it out when needed. The materials are strong but can be slightly slippery on leather seats. This is a booster seat, which is important to remember when pitting it against others on the market. You would use this seat with a child that is larger in stature and older, just as you would any booster seat. The product is really one of a kind. It is light-weight, only about a pound or so, and rolls up into a bag, for easy transport in an airport or while on the go. There are various colors and patterns to choose from for both boys and girls–basic black is always a good option! It is also easy to clean, however there is some mesh material that makes up the outer cover layer of the seat that may not be ideal for some messes. The seat can be inflated by mouth and takes just minutes to do so. Stowing is no problem. This is truly a versatile option for safety-minded families that want to be prepared! Blow Up Booster Seat for age 4 and up who weigh 40-80 lbs. Rolls up in to a carrying bag. Two harnesses to secure straps. Retail price $29.99 — amazing price! 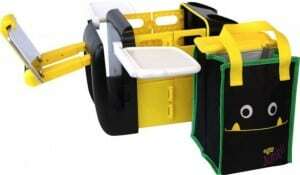 Portable booster seat – The booster seat rolls up in a carrying bag for easy storage in your car, purse or luggage. 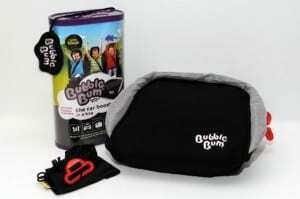 Inflatable – The Bubble Bum Booster Seat can easily be inflated by mouth when you need to use it and deflated when done. It’s lightweight and easy to collapse to take with you when you are on-the-go with a busy lifestyle. When condensed in its bag, its small enough to store in your car while not in use. To blow up, it only takes about 3 breaths or 20 seconds. The material is durable and easy to clean. Cost effective – this is a great option for grandparents too! Makes traveling with kids easy and safe. Folds up into a small bag making it easy to bring along everywhere. Positions the child in the correct place in the car. Compact booster seat that does not take up too much room in the backseat/diaper bag/carry-on. It can be slippery initially. Bubble Bum may want to consider adding a material that can grasp the seat just a bit more. Once positioned and buckled, it is easy to stay in place. The mesh portion of the product could be difficult to clean under certain circumstances. The idea of an inflatable leaves many wary of putting it to the test in a real-life emergency, BUT the Bubble Bum is completely safety tested and certified for booster seat use, just like any other hard plastic seat when used properly and in accordance with manufacturer recommendations. For only $30, this product is definitely worth the convenience. It would be perfect for grandparents or nannies who pick up your kids when you cannot be there. While we wouldn’t use this seat for a primary, every day kid-hauler, we LOVE the freedom to travel knowing that the kids are covered when it comes to impromptu pick-ups, Uber rides, taxis, hotel shuttles, and more! Overwhelmingly, those among us that have tried the Bubble Bum booster seat with our families recommend purchasing one (or two in the case of our editor-in-chief with twins!) Bubble Bum Booster Seat is a great product for families who travel with small kids. I would recommend this seat and will be taking it with us whenever we travel. Travel accessories can sometimes make or break a road trip. Bubble Bum has created two pieces of equipment to deal with some of the dilemmas that traveling with children can present. With a travel pillow and a little organization to the back seat, life can be a little easier–and you can roll on! When your backseat resembles a storage closet–or people mistakenly think you have a dozen kids instead of just two, it’s time for some preventative measures. The Junkie Back Seat Car Organizer is for just that — getting all of the essentials together in one place. 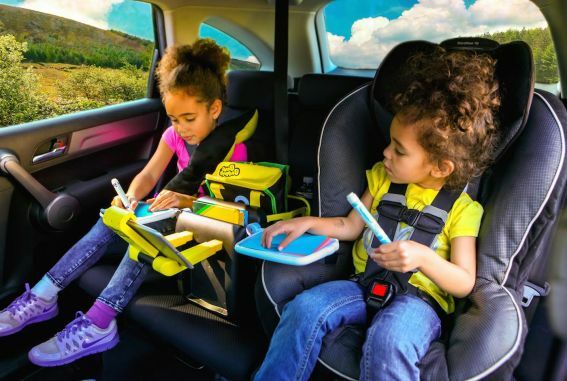 The Junkie fits easily between two car or booster seats and as an unexpected bonus acts as a bit of a barrier between the children for those woefully long trips! “Tech mount” to hold a tablet for kids to share, both kids can access, interact, and view together. Two retractable activity trays for snacking and play. Expanding compartment that fits the included removable tote bag to transport all your snacks and toys from home to car. The tote bag has an insulated side to keep snacks and drinks cool. The storage compartment can be opened to keep toys or snacks in the tote bag. When storage is not needed it collapses for a more compact activity center. The removable tote bag with an insulated pocket keeps drinks and snacks cold on one side and toys on the other and fits perfectly into the storage compartment. The two trays fold in and out of the organizer, one on each side, for holding snacks, toys or books. Two cup holders are convenient to safely keep kids’ drinks within reach. The Bubble Bum Junkie is intended to stay in place using the middle seat belt. We love the innovation of the features, but didn’t have much luck with the “stay in place” part, despite trying it in a few vehicles. The seat belts do not stay taut, so the organizer does not stay in place and slips out of the seat belt. If you can get the fit correct in your back seat, this accessory could prove useful for MANY reasons. All of the kids stuff in one place, easily within reach means less of the chanting: “Mom! I can’t find my book, ball, device, or juice!” A few extra minutes of enjoyment in any vehicle is well worth the price, which is about $39.99 on Amazon. It’s a little like having a black and yellow R2D2 sitting next to the kids, an inanimate helper to make journeys easier! This is by far one of the most useful travel pillows on the market. 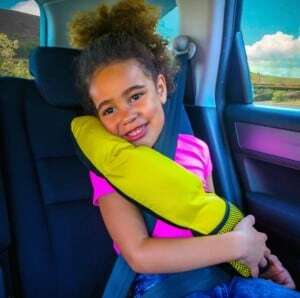 The design creates a multi-purpose pillow and/or comfort strap for both a child and adult to use! The mesh pocket on the front can hold a small drink, ipod or other item you might have with ease. It easily attaches to the headrest allowing for easy use during a long trip. The material is very easy to clean and the Velcro is durable. Stash pocket for a mobile device or other item your kids would like to store. The mesh pocket is useful in a variety of ways. It can convert into pillow or be used for neck support. It is only offered in one color/pattern. For only $14.99, this product is a great item to have for long travel rides. Whether, flying, car rides or bus trips, this item is definitely useful for your little one. I’d definitely recommend purchasing this especially after your child moves into a booster and doesn’t have the same headrest options that many car seats have. Superoo Reviewers: Sarah Cain is one of our Elite Reviewers from the Midwest, traveling with kids in tow for frequent family trips. Jennifer Candiotti is also a Superoo reviewer is an East Coaster with kids that loves trying new travel tips and tricks. This post was a collaborative effort. Disclosure: Complimentary samples were received for the purposes of testing this gear and writing this article. Multiple reviewers contributed to this collaborative article. No other compensation was received.